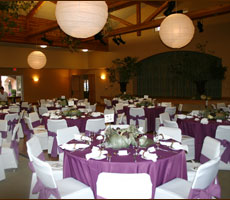 The Mary Agatha Furth Center is one of the largest and most elegant meeting and event facilities in the heart of the Sonoma Wine Country. 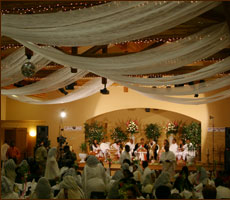 The spacious Ballroom can accommodate large wedding, community fundraisers, trade shows, and all types of other events. 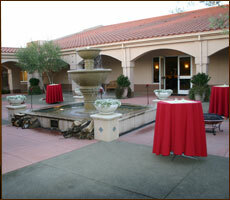 This event facility includes classrooms, and impressive courtyard with large fountain, a large commercial kitchen, performance stage, large dance floor, theatrical lighting, large video screen, and video projector. Everything you need to host your next major event. 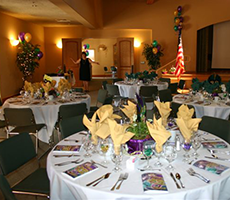 The Mary Agatha Furth Center is ideal for large dinner & dance events utilizing the 20’ x 20’ stage with theatrical lighting, disco ball, and 30’ x 30’ dance floor. With a spacious 94’ x 71’ floor plan, the Main Hall’s use is flexible and can be set up to accommodate up to 450 dinner guests with buffet lines, or table service. Renters arrange their own food and beverage services. The large commercial kitchen is ideal for outside caterers, or families staging the refreshments. The Furth Center does not charge corkage, and all beverage servers must comply with in-house beverage and security policies to insure safe events. large video screen and video projector, wireless internet access, hardwood stage with theatrical lighting, commercial kitchen, and portable beverage bars. The renter is required to make their own arrangements for food, beverages & cleaning.